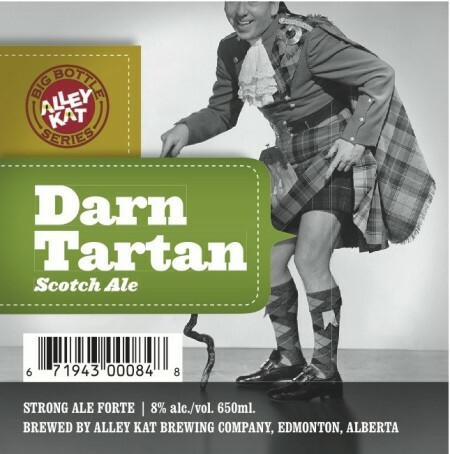 EDMONTON, AB – Alley Kat Brewing has announced the return this week of two popular seasonal brews, one of them under a new name. Sometimes known as a Wee Heavy, this beer is all about malt. It starts with an aroma of sweet malt with hints of toast and smoke. The flavour follows through with the malt showing lots of caramel and some hazelnut. Darn Tartan finishes somewhat dry with a bit of hop bitterness and a slight warmth from the 8% alcohol content. With a black colour and a roasted taste to tingle your tongue, this beer is perfect to keep you warm this winter. With a nice cream coloured head and a silky smooth finish, everyone will be asking for more. The release of both beers is being marked with a launch party at the Alley Kat brewery (9929 60th Ave., Edmonton) this Thursday November 25th from 5:00 to 8:00 PM. Samples of the new beers and other Alley Kat brands will be served along with food, and brewery tours will take place every half hour.